19-year-old Patrick Finnegan sat across from music mogul Kevin Liles and described himself as an "influencer" and a "disruptor." Liles, the former Def Jam records president who now runs 300 Entertainment, listened intently. With the ardor of a board room veteran, Finnegan said that it's time for brands like Coca-Cola (CCE) and Mercedes Benz to stop wasting money on TV and magazine ads that don't appeal to his generation -- or Gen Z, as it's frequently called. Instead, Finnegan said, they should invest in Gen Z "influencers" -- artists like 300 Entertainment's Fetty Wap and Young Thug, who have a combined 6.8 million Instagram followers. Finnegan has established himself as something of a Gen Z expert. He consults for marketing firms like Havas Luxe and is a partner at venture capital fund, Studio.VC. Gen Z, to be clear, is not the same as Millennial. The group is younger -- born in the late '90s to mid-2000s -- and expected to outgrow Millennials in size and buying power. Gen Z's buying power is already an estimated $44 billion. "Brands that used to solely focus on [Millennials] are just now getting how important Gen Z is, and I can help make that transition," Finnegan told CNNMoney. Patrick Finnegan, 19, talks business with hip-hop tycoon Kevin Liles. Finnegan has always had an entrepreneurial bent. At the age of 12, he raised $10,000 for President Obama's campaign and was invited to the inauguration. He made about $80,000 building websites for various clients while he was still in high school in Massachusetts, and landed a job with Intel (INTC) before he dropped out, moved to Portland and launched two startups -- a news app called World State and a web design company called onmsg. After his startups fell through, Finnegan moved to Manhattan and relaunched his career. 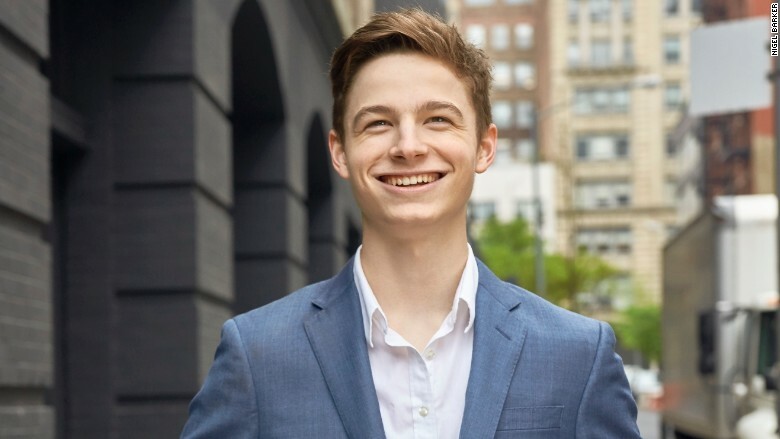 Now, at 19, he works with major marketing firms, investors and fund managers to help them understand younger demographics. Since moving to New York City, he's amassed an impressive list of contacts -- including CEOs, billionaires, and prominent angel investors. "I have a couple dozen people I can call, and say, 'Can you put $50 [thousand]?' Sometimes $1 million, sometimes $2 million," Finnegan said. His ability to network is a big reason Studio.VC founder Liam Lynch hired Finnegan. "Patrick is a fantastic networker, and he is a quick study on what people are interested in," said Lynch, who previously built Broadway marketing firm Key Brand Entertainment. "From my experience, there are great benefits to intergenerational teams." In return, Finnegan is paid a salary (he declined to say how much) and a cut of the $5 million fund's carried interest. He's also making between $3,000 and $7,000 a month through his consulting gigs. All told, he's on pace to make six figures this year. Finnegan said his business savvy comes solely from hands-on experiences -- particularly his failures. "I've been naive. Being young, you can get taken advantage of," he said. "When I was 16, I was working for a company [cloud computing firm MetricsHub] during prep school that was acquired by Microsoft. I was their first employee, and I didn't get anything." But his biggest learning moment, Finnegan said, had nothing to do with a lack of a formal business education. It came eight months ago when he showed up late to a meeting with one of his mentors after he'd been out partying in New York City. "He really believed in me, and I really disappointed him," Finnegan said. "I realized if I want to be this big Gen Z businessman, and for people to trust me, I can't be out partying. I have to be prepared, I have to give my 150% every time." Finnegan says he still makes time for fun, but he's far more focused on advancing his career. "I'm going to be a mogul. I want to disrupt the [establishment] because it needs to be disrupted."